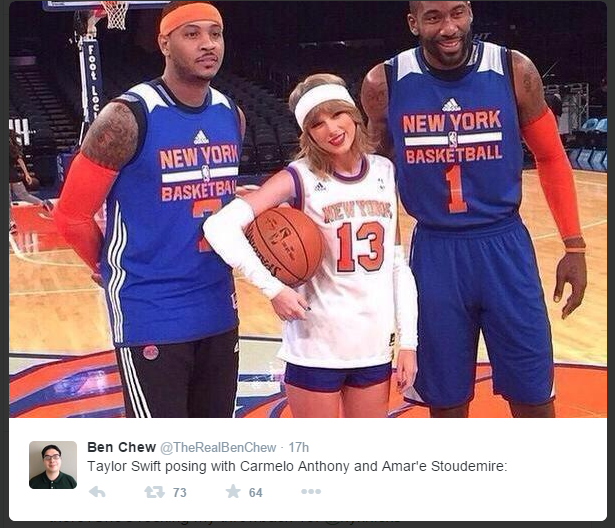 Yes, that’s really Taylor Swift in a Knicks jersey with Amar’e Stoudemire and Carmelo Anthony. However, there are at least two things we’re not really sure of here: one, whether or not Melo and STAT really listen to her songs and two, what exactly Taylor Swift is doing at the Knicks practice. But who cares, this photo is cool as it is. That’s former Knickerbocker Jerome “Junk Yard Dog” Williams getting a photo with the country singer as well. 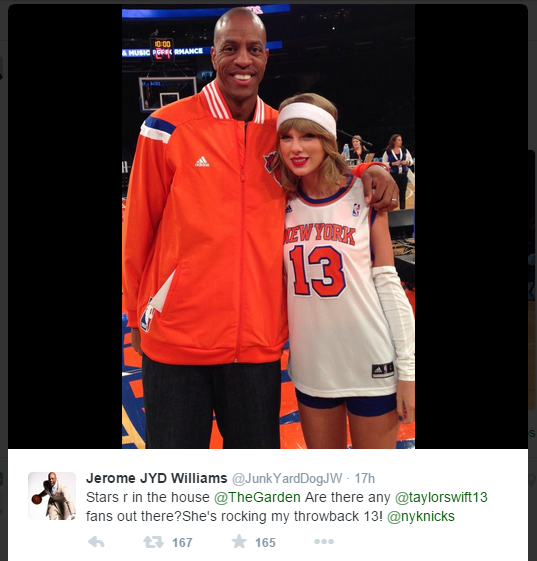 Okay, here’s the reason why T-Swizzle is hooping it up with the Knicks. She’s the newly named NYC’s Welcome Ambassador for Tourism. And what better why to show some New York love than by hanging out with the Knicks? Her new single “Welcome to New York” fits perfectly in her new role as ambassador; and who knows, maybe we can also expect a performance at Madison Square Garden come this NBA season.